Buses run regularly to Mt. Hotham from Melbourne and Albury during the season. (468km, 5½ – 6 hours). If you want to travel to Hotham or Albury by air, please see Mt. Hotham – By Air. 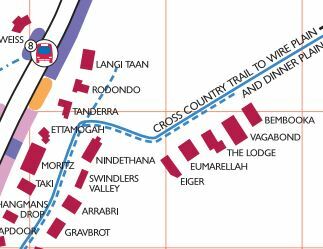 If arriving via Harrietville proceed through the village to bus stop 8 (the last stop). If arriving from Omeo, it is the first bus stop. Use the loading zone to unload your gear and transfer it to Eiger. A sled is usually available on the front entrance landing to make the transfer of gear easier. There is also a luggage delivery service by skidoo available from Jack Frost at bus stop 7, operated by Snow Tow. EIGER is situated approx. 100m from the road so proceed up the stairs and to the right at the top of the stairs and straight across to EIGER. Your car must be subsequently parked along the road or in a car park (Slatey Cutting etc.) as directed by the signs or attendants. A minibus service operates along the road to and from the car park. Snow chains are available for hire from Rays Ski Shop Myrtleford, Hoys Ski Hire Harrietville, Billies Omeo and Snow Monkey (Melbourne). 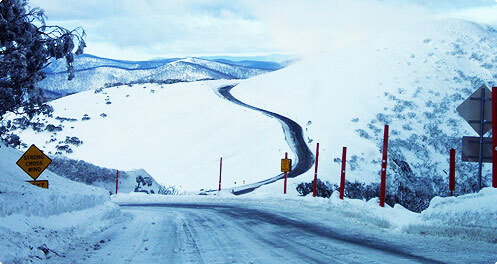 If you are travelling by car to Mt Hotham via Harrietville, we recommend hiring chains from Hoy’s Harrietville. They offer a free chain fitting service on the way up the mountain for Hoy’s hired chains (while you stay warm & dry in your car!). You can get information on conditions and resort entry there as well. Hoy’s provide secure parking at Harrietville so you can drive there and catch a bus to Mt Hotham. You can also hire Hoy’s chains from the Omeo Service Station. If you’re going to need chains throughout the season, you can hire from Snow Monkey for $95. Let them know your dates by each Wednesday before the weekend/week and they will deliver to select suburbs or you can pick up from Collingwood. Also get 20% off ski and snowboard hire with this chain deal.